"Pressure" is the ratio of a normal force to the area on which the force acts. Think of a column of fluid of height h and cross sectional area A. The fluid has a density rho. The pressure P at the base of the column is by definition the force exerted on the base divided by the area A; that force is the weight of the column plus any force acting on the top. This is the formula for the pressure due to a column of fluid, or "hydrostatic pressure". A tsunami is not a sub-surface event in the deep ocean; it simply has a much smaller amplitude (wave heights) offshore, and a very long wavelength (often hundreds of kilometres long), which is why they generally pass unnoticed at sea, forming only a passing "hump" in the ocean. A tsunami wave in deep water creates a small but measurable change in pressure that will be maintained for as long as twenty minutes. Tsunamis have tremendous force because of the great volume of water affected and the speed at which they travel. Just a cubic yard of water, for example, weighs about one ton. Although the tsunami slows to a speed of about 48 km/h (30 mph) as it approaches a coastline, it has a destructive force equal to millions of tons. Waves are formed as the displaced water mass moves under the influence of gravity to regain its equilibrium and radiates across the ocean like ripples on a pond. 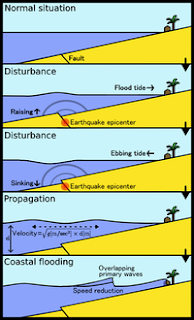 Tsunamis act very differently from typical surf swells; they are phenomena which move the entire depth of the ocean (often several kilometres deep) rather than just the surface, so they contain immense energy, propagate at high speeds and can travel great trans-oceanic distances with little overall energy loss. The wave travels across open ocean at an average speed of 500 mph. The passing "hump" mentioned earlier is a "momentum flux" equal to density multiplied by the square of the velocity. This gives the transient pressure built up during the quake as equal to twice and in addition to the hydrostatic pressure. There is no proof for this. As any object moves through the atmosphere is creates pressure waves. These are simply small disturbances caused by forcing air molecules closer together. These disturbances are then transmitted through the atmosphere, just like waves passing energy through the ocean.